It was with some trepidation that I saw Fantastic Beasts and Where to Find Them, the latest entry into J. K. Rowling’s Wizarding World. The first trailer didn’t exactly sparkle with magic, and the fact that five movies were being made out of one tiny supplementary book didn’t exactly fill me with confidence. Add to that the huge letdown that was Harry Potter and the Cursed Child earlier this year (the script, and not the play – unfortunately I haven’t seen that yet), so I readied myself to be letdown again. Fantastic Beasts blew every preconceived notion out of the water. Surprisingly it’s knocked 10 Cloverfield Lane off the top spot for the movie of the year. 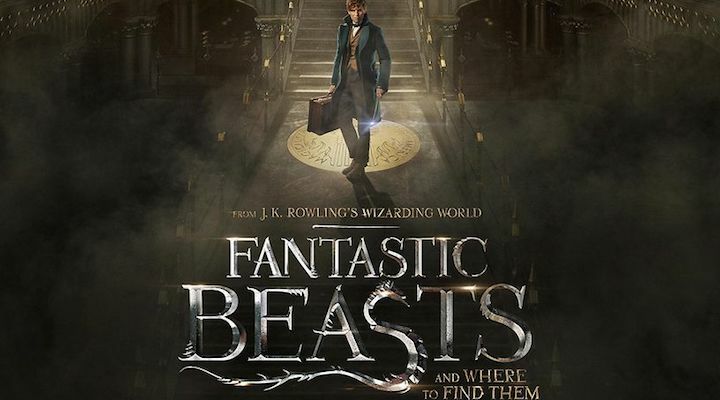 It’s very clear that this is a movie written by J. K. Rowling, and this makes everything sparkle with her imagination. From the characterisation of the principal characters, the ingenious look of the creatures, and the emotive language employed (there’s a wonderful line in which Newt Scamander tells the No-Maj Jacob not to worry because ‘Worrying means you suffer twice’ that sounds like it came directly from Dumbledore himself! ), everything screams Rowling, and that’s what makes this a fantastic (pun intended!) entry into her world. And that’s where The Cursed Child fell flat – it was written by Jack Thorne, who managed to create some good characters from the newbies, but who unfortunately managed to ruin every returning character bar Snape. It’s not his fault, but he just didn’t have the . . . charm that Rowling has. I read a review earlier that stated Fantastic Beasts was a good movie but that it wasn’t Harry Potter – but it’s not trying to be. Rowling isn’t trying to remake that story – it’s done. All she’s trying to do is emulate the magic of it, and it works exceptionally well. Take Eddie Redmayne as Newt Scamander. Redmayne is like Benedict Cumberbatch, in that every single role he plays is identical to one another, and yet his trademark bumbling awkwardness works for Scamander, who isn’t quite sure of himself. Whilst not fully immersed within the role yet, future movies will surely see him produce a protagonist to rival Harry himself. The same goes for Katherine Waterston’s Porpentine Goldstein. She’s not quite there yet, particularly in the opening of Fantastic Beasts, but by the climax there’s a real sense that this character has matured into somebody memorable. Her time with Scamander changes her (quite how far depends on how invested in this world you are, and whether you’ve read the Fantastic Beasts and Where to Find Them book – but no spoilers here). Surprisingly it’s the two supporting roles that shine more. Alison Sudol’s Queenie Goldstein doesn’t get that much to do compared to Redmayne and Waterston, but there’s a vulnerability to her that reminded me of Luna Lovegood. She’s an outsider, somebody thought of as weird, and yet she doesn’t let this get her down. Sudol does wonders with this role and I genuinely can’t wait to see her develop in future movies. But it’s Dan Fogler who manages to steal the movie as the No-Maj (that’s American for Muggle, don’t you know) Jacob Kowalski. Jacob is Fantastic Beasts’ Harry. Harry served as the reader’s and viewer’s eyes in Harry Potter and the Philosophers Stone to introduce us to this world, and Jacob takes on this role here, as every other character is clued in on what’s already happening. Whether it’s his unabashed laughing due to gigglewater, or the fact that he has to jump several times to get his girth inside of Scamander’s magic suitcase, Fogler as Jacob is the epitome of a Rowling character – warm, kind, believable, and, yes, magic. Rowling has the ability to create characters – they’re fully dimensional, whether they’re good or bad, and Jacob instantly goes to the top of her best characters ever. Speaking of Scamander’s case – wow. There’s a scene in the first half in which Scamander and Jacob go inside of the case and it’ll take your breath away. It truly is magical. It’s immersive, helping the viewer invest in this world by showcasing the prowess of Rowling’s imagination. It’s one of those scenes that have to be seen to be believed, but it’s likely the highlight of a fantastic movie. The rest of the cast don’t quite sparkle as brightly, though. Colin Farrell’s Percival Graves feels, to me, like stunt casting. He doesn’t get an awful amount to do, but come the close of the movie it’s apparent why he was cast. Carmen Ejogo’s President Seraphine Picquery is your typical Rowling political figure – she comes across as truly unlikeable, but that was probably the intention. And Ezra Miller was probably cast as Credence Barebone because he has the LOOK of a tortured soul, which is great because he spends most of the movie broodily looking at powerful figures. Whilst none of these three are particularly memorable, they help to flesh out this 1920s world. So what about the plot? Well, from the title alone, and the first trailer, you’d be forgiven for thinking this would be a happy jaunt through America as Scamander rounds up escaped beasts. And that’s pretty much what happens. It doesn’t grate because it’s injected with Rowling’s charm. But what works in Fantastic Beasts’ favour is that the threat (because let’s face it, there IS one) works alongside the premise of rounding up the magical beasts. The modus operandi of the villain is identical to that of some of the beasts – destroying buildings and causing carnage. And because of that it works well. I’m intrigued how far this can stretch for five movies, but I suspect that future instalments will see Scamander take a backseat role. Why? Because the threat of Gellert Grindelward looms large. It’s no spoiler to say that Fantastic Beasts is set against the backdrop of his rise to power – his name is littered throughout the trailer, and any true Harry Potter fan will be able to deduce it due to when Fantastic Beasts is set. Future movies will hopefully explore this dark era more. There’s plenty of reasons to see Fantastic Beasts if you’re a true Potter fan – it’s dripping with Easter eggs. Whether it’s the fleeting glimpse of a grindylow, or the memories of Hagrid’s Care of Magical Creatures lessons that the niffler induces, or the fleeting references to Dumbledore and Hogwarts, every single one of them will plaster a grin on your face. It’s so nice to be back in the Wizarding World in what is surprisingly a FANTASTIC movie.